It’s been available on mobile devices for a few weeks, but now PC players finally get their chance to try out the latest — and first free-to-play — incarnation of the world’s first collectible card game. Magic Duels has officially launched on Steam, bringing players the Magic: The Gathering experience in both a single-player story mode, an interactive deck builder, a library of hundreds of cards, and online multiplayer battles, including the popular Two-Headed Giant mode. 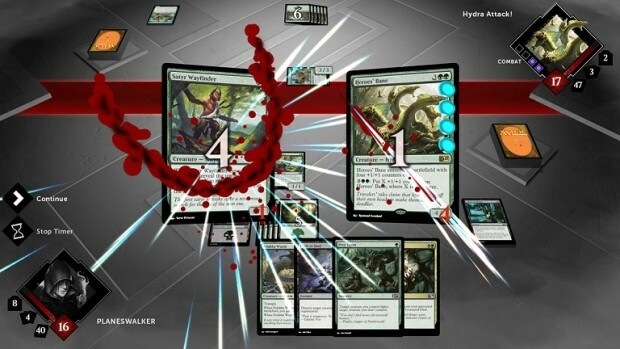 The free-to-play Magic Duels has a card-acquisition system similar to Hearthstone: Heroes of Warcraft, which Wizards of the Coast no doubt saw as a major success and is trying to emulate. We’ll have our review up as soon as we’ve gotten some serious play time, so stay tuned! Why are you using the graphic image from Magic 2015? Also not much information about the game here… come on! The store page seems to have been de-listed while the connection issues are being worked on. You can find the page if you have a direct link, but at the moment it won’t appear in search queries or under the new releases section. Can’t connect to the servers; can’t progress the tutorial because I’m not connected to the servers. People who played on the mobile version (which was soft launched weeks ago) complain about numerous bugs. No release date given despite streamers with thousands of live viewers broadcasting the game for advertisement. All of a sudden the game releases with no announcement (by the way you can’t even find the game on Steam without directly clicking a link. Arbitrarily pointless rarity rules on deck building (which do not exist in any form in physical MTG). Many many missing cards among the sets that are given – i.e. no mana creatures at all. To top it all off, the deck builder is terrible. This game is just another of many marks against WotC and their incompetence. These imbeciles need to realize that people want to play Magic the Gathering, not Magic the Hearthstoning, not Magic Lite, not the abomination known as MtGO. They will pay money for Magic the Gathering, but not this fetid turd.